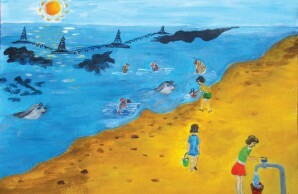 A painting by a ten-year-old Azerbaijani girl imaginatively portrays children carrying and pouring clean water into the Caspian Sea, to combat the falling sea level and the pollution that harms the seals and fishes. Containing some 18,800 cubic miles of water and covering more than 143,000 square miles, the Caspian Sea is the largest inland body of water on Earth. It has about a third the salinity of seawater, however, so it is not the largest freshwater lake (that honor goes to Lake Baikal by volume, or to Lake Superior for area). The salinity is in large part a residue of the sea’s formation. Along with the Black Sea and the Sea of Azov to its west (which are not entirely landlocked) and the Aral Sea to its east, the Caspian is a remnant of the ancient Paratethys Sea. As long as 65 million years ago, the Paratethys was connected to both the Atlantic and Indo-Pacific Oceans. 5 million years ago, through shifts in the Earth’s crust, a large landlocked sea had formed where the Caspian and its neighbors would later take shape. The waters became fresher, but then a link to the ocean was again established and a marine environment returned. About 2 million years ago that link to the ocean was closed, and the inland waters again became much fresher, through rainfall and the melting of glaciers. Eventually the Caspian Sea severed its connection to the Black Sea and became permanently landlocked. The Caspian is fed by 130 rivers, the most significant being the Volga, which enters from the north and accounts for about 80 percent of the inflowing waters. In spite of the influx of freshwater, however, the sea remains salty, especially toward its southern end. The Caspian has no outlets, and in consequence loses water only through evaporation, a process that may tend to increase its salinity. Owing to its large size, its long isolation, and its brackish waters, the sea supports an unusual collection of organisms. Among them are at least 331 endemic species, from zooplankton to mollusks and vertebrates. Most notably, the Caspian boasts five species of sturgeon, including the beluga, prized for their caviar. That population comprises 90 percent of the world’s sturgeon stock. Such valuable aquatic resources, as well as lands suitable for agriculture (watermelon is a prime crop), have attracted dense human settlement to the coastal areas. Scientists who study the ecosystem have therefore become increasingly engaged in protecting it from industrial pollution and other damaging effects of human habitation and exploitation. One consequence of the Caspian’s isolation from the world ocean is that its sea level—currently more than eighty seven and a half feet below the ocean’s mean sea level (MSL)—rises and falls depending largely on variations in rainfall in the watersheds of the Volga and other rivers. The changes in water level have affected the lives of nearby inhabitants since ancient times. In 1991, the Russian historian and geographer Lev Gumilev suggested, in The Millennium around the Caspian Sea, that severe encroachment of the sea played a significant role in the decline and fall of the Khazar khanate in the tenth century ad. The khanate, which had risen in the seventh century, controlled a huge territory to the northwest. The Caspian Sea also varies in other ways. Broadly speaking it has three sections—northern, middle, and southern with roughly similar areas but significantly different depths and volumes of water. The northern part is shallow, averaging only 20 feet deep, and encompasses less than 1 percent of the waters. The middle, averaging more than 600 feet deep, holds about 35 percent of the water, whereas the southern reaches, which average 1,000 feet in depth and reach a maximum of nearly 3,400 feet, contain the rest. Salinity in the three sections differs as well, being significantly lower in the north than in the middle, and slightly higher still in the south. That is only part of the variation, for regions near the mouths of rivers may be nearly fresh, whereas shallow gulfs can be saltier. In earlier times, the water salinity appears to have been more stratified vertically, and the bottom of the sea was very low in oxygen. Whatever organisms lived in the depths appear to have been eliminated. Today the waters are well circulated (strong winds stir them up, particularly from November to March), but little life has colonized the depths below 300 feet. Generally not counted as part of the Caspian Sea proper is the Kara-Bogaz-Gol, a shallow gulf or lagoon to it by a narrow strait. Its level is usually ten or twelve feet lower than that of the Caspian; water from the sea drains into the gulf and then quickly evaporates. Ten times saltier than the oceans, the Kara-Bogaz-Gol is almost devoid of life. Its effect, though, is to keep the Caspian from becoming saltier than it is. Organisms in the sea originate from a range of freshwater and marine sources. Most noteworthy are those that represent ancient Caspian species or their direct descendants, but many have been introduced through human activity, whether by design or inadvertently. 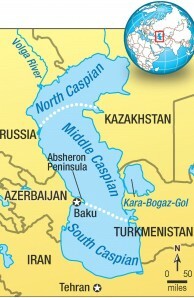 In a major review of research on the origins and current state of the Caspian Sea, prepared in 2004 for the World Lake Basin Management Initiative, Nikolai Aladin and Igor Plotnikov of the Zoological Institute, Russian Academy of Sciences, in St. Petersburg, boldly compare the Caspian to Australia. Both geographic zones are long-isolated worlds where evolution followed its own course and where so-called fossil species persist. Among the latter in the Caspian are the sturgeons, members of an ancient family that, perhaps as a result of competition with more modern families of bony fish, became less common elsewhere in the world. All the Caspian sturgeon species are now considered critically endangered, but that is not simply a result of overfishing and poaching. River dams have interfered with the sturgeons’ access to their spawning grounds, and the species survival now depends not only on protection but also on replenishment through hatcheries. Aladin and Plotnikov divide the Caspian’s organisms into four groups. The first are the “indigenous species,” such as the sturgeons, whose ancestors inhabited the Paratethys Sea. The second are “glacial relicts,” comprising Arctic species introduced between 1.5 million and 1 million years ago as a result of flooding when a huge northern ice sheet melted. The third group, “Atlantic introduced species,” includes species from the Black and Mediterranean Seas. Some appear to have arrived 50,000 years ago, when there was a temporary connection between the ancient Caspian and the basin of the Black and Azov Seas. 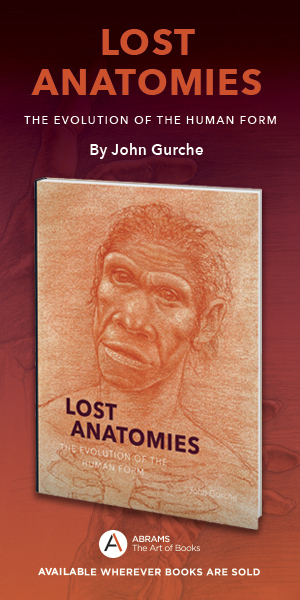 Most, however, have been introduced in recent times throughaccidental or deliberate human intervention. Atlantic species introduced in the first part of the twentieth century included an alga, a marine worm, two mollusks, two species of shrimp, and three fishes. Then in 1952, a shipping canal between the Volga and Don Rivers was completed, connecting the Caspian with the Sea of Azov and ultimately with the world’s oceans. That allowed new species to enter the Caspian attached to ship hulls and in ballast water. Finally, there are freshwater species, some of which, such as certain mollusks, may have colonized the Caspian several million years ago. Others, such as the Caspian carp, entered during more recent periods when conditions were favorable. Among the persistent threats to the seal, the IUCN notes continued legal commercial and scientific harvesting, bycatch in fisheries and killing by fishermen, mass mortality events in 1997 and 2000-2001 from canine distemper virus, contaminants such as DDT, and pup mortality from wolves and sea eagles. An invasion of the comb jelly Mnemiopsis leidyi, a medusa-like organism introduced though ship ballast water in 1999, is a great threat because the species consumes zooplankton, affecting the whole food chain. During the spring and summer of 2001, perhaps owing to a seismic event that released toxic gases, there was an estimated 40 percent decline in the stock of kilka, or sprat (Clupeonella spp. )—a major food fish for the Caspian seal and beluga sturgeon as well as for humans. Fisheries scientists attributed the stocks’ failure to recover to the comb jelly, which not only competes for the sprats’ main food source, but also feeds on their eggs and hatchlings. By 2004, the Azerbaijani catch of anchovy kilka, the most commercially important species, had dropped 73 percent since the introduction of M. leidyi. One general threat to the Caspian is pollution, a significant source of which is oil. Each year some 1.5 billion barrels of that resource, pumped from wells around the seacoast and in the sea itself, are extracted, refined, and transported. Major pipelines are routed from Kazakhstan to China and from Azerbaijan to tanker terminals in the Black Sea and the Mediterranean. Tankers also travel via the Volga River and the Volga-Don Canal to the Sea of Azov and beyond. Almost half of Caspian oil is produced by Kazakhstan, with more to come, and one proposal is to add a pipeline to carry oil from that nation across the Caspian Sea itself to Azerbaijan, to link up with the pipelines that reach farther west. The history of commercial oil and gas exploration and production in the region goes back nearly 150 years, so oil pollution is not simply a hazard of current activity. Some capped wells leak, and the fluctuating sea level has at times flooded onshore oil wells and oil-contaminated soils. Natural seepage also contributes to surface oil slicks and water column pollution. Under normal conditions, winds stir up ten-foot waves even in shallow parts of Caspian. That can help remove some lighter oil residues. But in recent years, winds in the northern and middle parts of the sea have declined markedly in velocity and frequency, as documented in Present State of the Caspian Sea, which was published in 2005 by Gennady N. Panin, a scientist at the Institute of Water Problems of the Russian Academy of Sciences; Ramiz M. Mammadov, deputy director of the Institute of Geography at the Azerbaijan National Academy of Sciences (ANAS); and Igor V. Mitrofanov, at McGill University in Montreal. Azerbaijan is also a significant oil country, but four-fifths of its 500-mile coastline is considered suitable for habitation and recreational use. This was recognized in Soviet times by a 1983 order recommending that those coastal lands be used for health resorts. Today more than 3 million Azerbaijanis, a third of the population, live near the sea. Taking that into account, in 2008 the president of Azerbaijan, Ilham Aliyev, signed an executive order to devote a projected $2.5 million to the installation of small-scale wastewater treatment plants. Facilities are already in operation in some districts of Baku. A second general concern is that, like the Aral Sea, the Caspian may be on a path toward drying out. In the early 1960s, the Soviet Union built large dams across rivers feeding the Aral Sea, to irrigate cotton and rice fields. 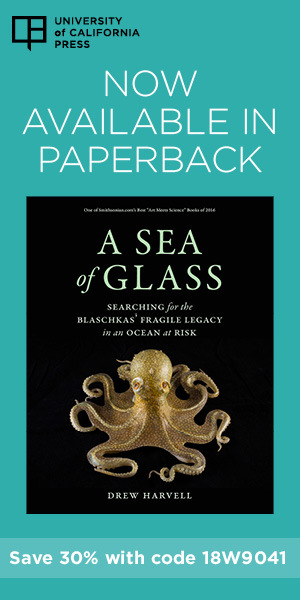 In a mere thirty years that sea shrank dramatically and its economic value was lost. River water that feeds the Caspian is similarly being diverted for agriculture and other purposes, or is evaporating from upstream reservoirs. But Mammadov has concluded that the fate of the Caspian hinges not on dams but on climate change. He estimates that human factors—including oil spills, which create a veil that interferes with evaporation—are responsible for no more than 3 to 5 percent of the variation in the Caspian’s sea level. Climate change may alter rainfall and the rate of water evaporation in river watersheds as well as evaporation from the sea itself. A one-foot drop in the Caspian Sea level in the second half of 2010 has been attributed to unusually hot spring temperatures. Higher temperatures during the past few years have also warmed the upper layer of the sea to greater depth, with adverse effects for certain aquatic taxa. The higher temperatures—and, especially in the south, the consumption of grazing zooplankton by M. leidyi—have also led to blooms of phytoplankton (eutrophication) in both the northern andsouthern parts of the Caspian, which cuts oxygen levels needed by other organisms. Promoting eutrophication is the inflow of organic material from rivers and onshore industry and even untreated sewage from settled areas. In addition, a trend toward warmer winters seems to be reducing the seasonal ice cover that forms in the northern section of the sea—ice cover that is prime breeding habitat for the seals. Efforts to protect the Caspian Sea and its organisms are complicated politically. At one time the sea was bounded by the Soviet Union and Iran, but with the fall of the Soviet Union in 1991, its former territories were divided between the independent nations of Azerbaijan, Kazakhstan, Russia, and Turkmenistan. Twenty years on, the five states haven’t agreed on a final division of the Caspian waters, and still depend on a 1970 pact. However, policymakers in the four former Soviet countries have made a first joint step toward protecting the sea, namely the Framework Convention for the Protection of the Marine Environment of the Caspian Sea, which was signed in 2003 and entered into force in 2006. Its aims are environmental restoration, protection from pollutants, and the sustainable use of resources. In Soviet times, the Caspian Sea’s environment and natural resources were under study by science academies and government ministries. Today such research is much reduced. In a 2010 paper, the eminent paleontologist and geologist Akif A. Ali-Zadeh, a vice president of the ANAS and Director of the Geology Institute, reported that after the Soviet era all research institutions were weakened or unable to function owing to financial difficulties or to entanglement in long-lasting legal disputes. He emphasized the urgency of establishing an international scientific organization for research on the sea’s environment. Progress was made the following year. On April 26, 2011, President Aliyev attended and gave a speech at the ANAS an nual general assembly. On the same occasion Ali-Zadeh also spoke, offering to create a research center. Just three days later, the president signed an executive order creating the Caspian Research Center in Baku, to support future collaborative work. In 1996, Mammadov and a colleague at the Geography Institute of ANAS, the late Abbas Humbatov, participated in a conference in Iran on forecasting the water level of the Caspian Sea. In their presentation they predicted that in 2010 the water level would be a little more than eighty-seven feet below MSL, a prediction that came very close to the current depth, which is just four inches lower. In that same paper they also predicted a further drop, of nearly four feet, by 2050. If that trend continues, the Caspian may indeed go the way of the Aral Sea. In any case, Mammadov says, human attempts to counter the effects of climate change may be of little avail. Baku’s Giz Galasi (Maiden Tower), a national landmark, is a remnant of the twelfth-century walled city, and is itself perhaps even older. Today it stands near the seaside boulevard, about 700 feet back from the shore. Originally it jutted into the sea. According to a folk tale, a king’s daughter committed suicide by throwing herself from the top of the tower down into the water. Tradition has it that someday the sea will reach as far as the Maiden Tower again, but if scientific predictions are correct, that will not happen anytime soon.